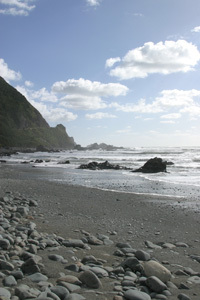 Individually crafted at home by our small team of stone weavers who hand harvest this wonderful resource from the rugged West Coast of the South Island of New Zealand. 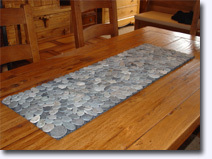 Stone place mats and table runners protect the table surface from heat. Can be washed with a mild detergent and water. 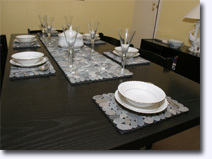 Unique flat stone table mat sets, now available in 3 different collections. 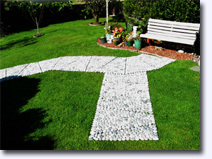 We use heavier grade flat stones, together with a much heavier backing for our range of floor mats. 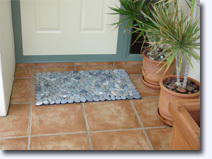 Weatherproof durable stone mats that can be used both inside or outside the home. Floor mat / Door mat. Bath mat / Shower mat. Coming soon to the U.K.
Soothing to the eye and feet. 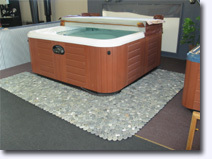 Stone spa mat now available at Splash Spas. Designed for the conservatory or garden. 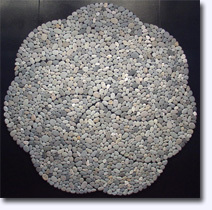 Click on one of the photos above for more information on our Stone Mats.